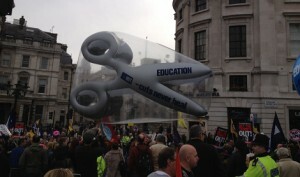 150,000 people attended the TUC anti- cuts demonstration in central London on Saturday. On the ground ELL reporters followed groups of activists from Hackney and Lewisham who shared stories about the impact of cuts on their communities and why they were attending the march. 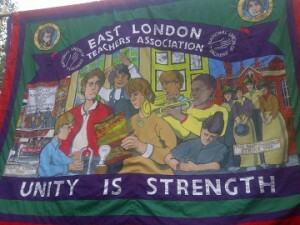 Thousands of activists, including people from the EastLondonLines boroughs, will march today in the TUC (Trades Union Congress) demonstration, “A Future That Works”. The march will go through central London and end up with a rally in Hyde Park. 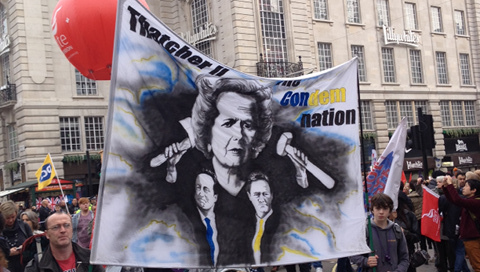 Labour leader Ed Miliband is expected to talk to the protestors. 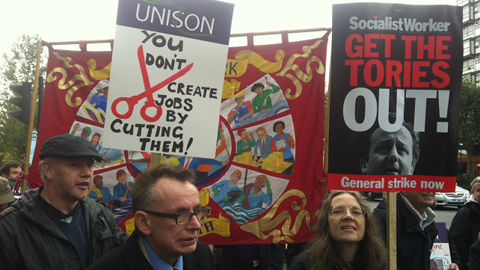 Hello and welcome to ELL’s coverage of the TUC demonstration in central London today. The demonstration is now over but you can read the blog from today below. The following people contributed towards the blog: Alice Yehia, Sophie Robinson-Tillett, Helen Lock, Joanna Kindeberg and Jo Abbas. 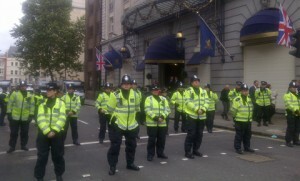 The Met police tweet that the rally and march are over and here are some more pictures from today. 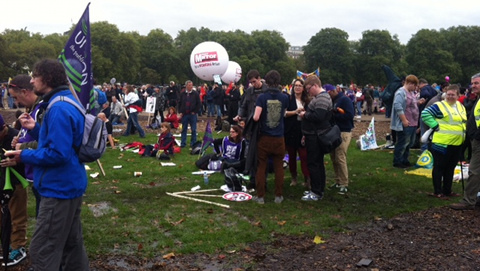 TUC has confirmed the rally is now over and estimates a 150,000+ turn out. An ELL report on the possible closure of stations across London can be found here. 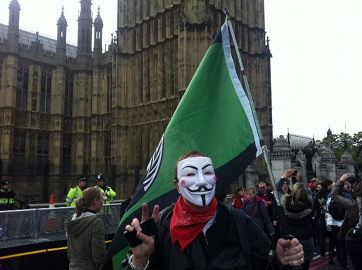 ELL reporter says a group of protestors are trying to shut down stores on Oxford Street and Regent Street. Paul McKeever, the chair of the Police Federation, released a video with a message of solidarity on the TUC’s ‘A Future That Works’ website. Reporter Alice Yehia reports that people are chanting:”What do we want? General strike. When do we want it? Now.” She also reports that the atmosphere is becoming more chaotic. 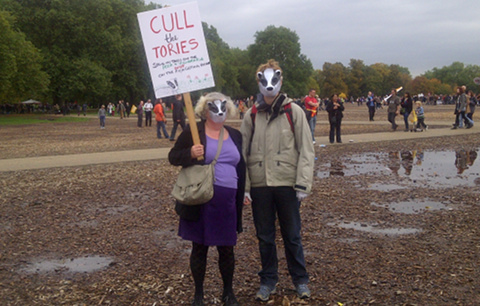 Our reporter Helen Lock says that crowds in Hyde Park are becoming “rowdy” and the chanting has got louder and more serious. 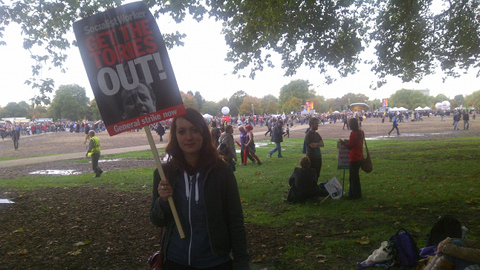 She said that big groups from the Socialist Workers Party are chanting “get back to Eton” as more police arrive. 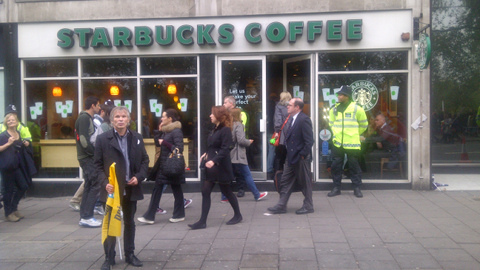 An ELL reporter said that the police are guarding Starbucks, it seems they have picked up on rumours that they could be occupied. Ed Miliband is now talking at the rally, the crowd is lively and horns are blowing. He says: “There will still be hard choices” which was met by boos. The crowd are still booing as he talks about tough measures. There are mixed responses from the crowd. Met police confirm that the rear of the march is now at Whitehall. 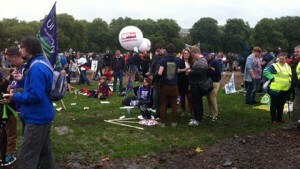 Ed Miliband, leader of the Labour Party, is to address the rally shortly. Our reporter says the chanting is intensifying and people are spreading out. 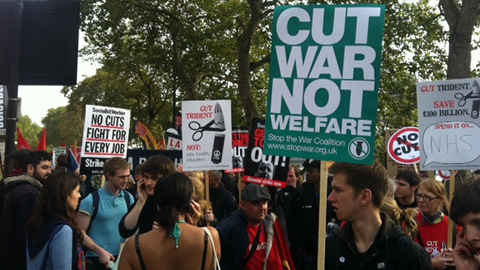 Here’s an interesting article in the Guardian by Dan Milmo, ’10 alternatives to austerity’. Len McCluskey, general secretary from Unite is now speaking at the rally. He said:”We need growth that fulfils the need of the people”. 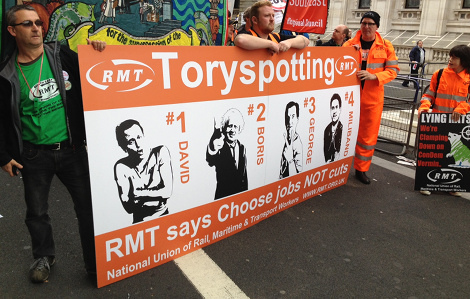 Our reporters have just reached Trafalgar Square where people are chanting “I’d rather be a pleb than a toff”. They are referring to the resignation of chief whip Andrew Mitchell yesterday after allegations that he called a police officer a ‘pleb’ continued to resurface to the detriment of his career, full story on the Guardian. 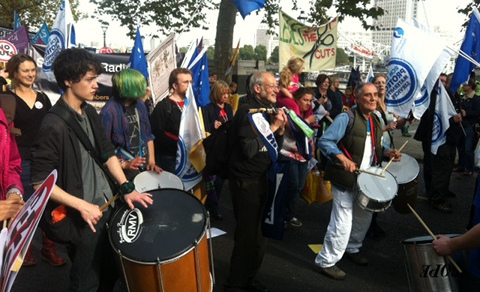 ELL reporters have followed the march through Westminster. Reporters Alice Yehia and Helen Lock are now in Westminster. They say the spirits are high but people are clearly angry about the impact of cuts on their communities. Reporter Alice Yehia is currently by Embankment. She said that people are playing bagpipes and there are representatives from the Fire Brigades Union. 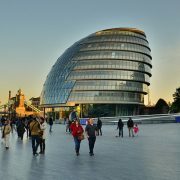 Read an EastLondonLines report on the possible closure of fire stations throughout London here. A spokesperson for Metropolitan Police just told EastLondonLines they try to “steer away” from giving estimated numbers for participants in today’s march because they tend to be conflicting. However, police just tweeted this (below), which indicates that the march is very large. The march is following a planned route: Victoria Embankment > Bridge Street > Parliament Street > Whitehall > Trafalgar Square > Cockspur Street > Pall Mall > Lower Regent Street > Piccadilly > Hyde Park Corner > finishing at Hyde Park. 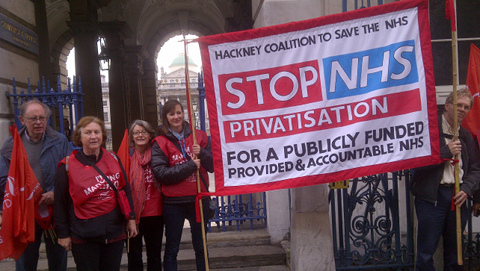 “In Hackney we’re very lucky, especially with doctors who are often very principled and dedicated to community health. They are prepared to keep fighting for that. We’re hoping the campaign can be an example to the rest of the country. 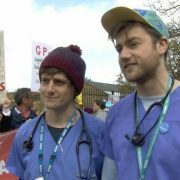 “We’re also asking for the Labour Party to have a practical plan of how to reverse the changes that are taking place in the NHS. The community itself must really get involved otherewise this won’t work and we won’t win the fight. We need to all understand what is happening and make decisions ourselves about what we want to happen to our loca health service. 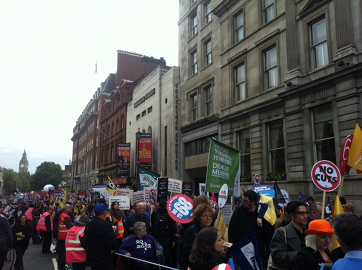 TUC General Secretary Brendan Barber is to speak at the end of the rally today. “It is fantastic to see so many people here today from every part of our community, all utterly determined to build a better, fairer future for our country. “We have a stark and united message for the government. Austerity isn’t working. It is hitting our jobs, our services, our living standards. “It is hammering the poorest and the most vulnerable. 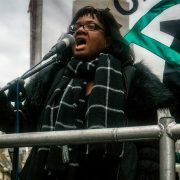 “And austerity is failing even on its own terms, for this is a government of broken promises. “Ministers told us that if we only accept the pain, recovery would come. Instead we have been mired in a double dip recession. “They told us if we only accepted the cuts, our deficit would come down. Instead our borrowing is going through the roof. “The biggest lie of them all was the cynical double talk that ‘we are all in this together’ .The grim reality has been tax cuts for the richest with wage and benefit cuts for the poorest. Some of the placards are calling for a general strike and a spokesperson for the Green Party recited a monologue between the PM, David Cameron, and the chancellor, George Osbourne to the crowd. Some interesting Tweets so far: Public and Commercial Services Union has just tweeted about a very dedicated protestor and Melanie Haslam has tweeted about the police presence. Our reporters say the chants are getting creative: “They got bailed, we got sold out”. The local Green Party is joining in. Protesters are now marching down Black Friars Road, our reporters say the march is picking up more people, including cyclists, as it goes along. Reporters Alice Yehia and Helen Lock are following Goldsmiths students and Lambeth College Unison, Southwark Unison, and the Teachers Association. The Goldsmiths Students’ Union president, Samson Osun, is supporting various political groups from Goldsmiths, he said: “I think this march is important to show solidarity with the public sector experiencing cuts and the cuts in higher education, especially arts and humanities. Reporter Sophie Robinson-Tillett is following ‘Hackney Keep our NHS Public’. Interview with the chair of the group to come later. We have on the ground reporters- Alice Yehia, Helen Lock and Sophie Robinson-Tillet- following groups of activists from the ELL boroughs. 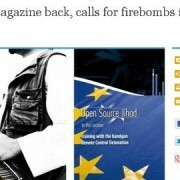 Stay with us for exclusive interviews, pictures and real time reporting. To find out more visit here. Does Sadiq deserve his ‘Green Mayor’ reputation?